The Nikon 300mm f4E PF ED VR AF-S is the first F-mount NIKKOR lens offers the ultimate balance of compact build, telephoto reach, and beautiful image quality. 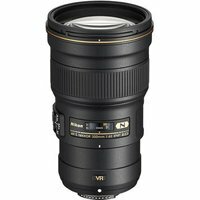 Ideal for sports and wildlife photography, as well as travel shots and portraiture, this lens is the smart choice when you want to fill the frame but not your bag. The combination of f/4 maximum aperture, 300mm focal length, and impressive VR technology enables superb results in diverse conditions. The phase Fresnel lens element significantly reduces size and weight, and a fluorine coating repels water, dust, and dirt for enhanced durability.